We provide our fence clients with excellent service and fence products. Most importantly DFW Fence Contractor is striving to take the fence industry to new levels of expectation. All of our sales representatives are former Military. Hence our Military backgrounds and common fencing know how helps us to deliver superior products and service. We have been in the fence business since 1998 and have become one of the leading fence companies in Dallas and Fort Worth. There are many fence companies to choose from. Please consider the one with a code of ethics and standards that was taught from our military experience. We have crew leaders on every job site leading our workers to construct a perfect fence for you and your home. As a result consider DFW Fence Contractor your fence contractor of choice. Here is a copy of our fence warranty. 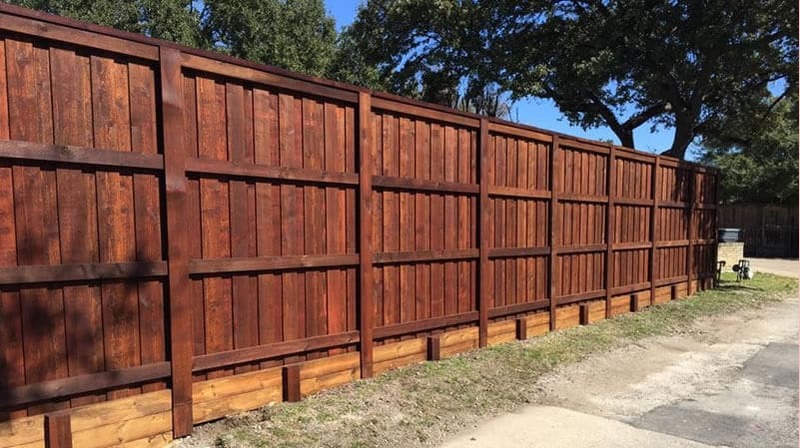 DFW Fence Contractor installs all types of Wood Fence. Such as a basic Spruce Dogeared to our more custom Western Red Cedar. Our wood fences may be upgraded in many ways like Footer boards, Top Caps,Trim Boards and Hand dipping them in oil based transparent Stains. DFW Fence Contractor also installs Iron Fence and Drive Gates. We hand build iron fence and purchase pre-made iron fence. Our drive gates are custom orders to fit each driveway. DFW Fence Contractor also installs Chain Link fence. We install both residential chain link and commercial chain link. Chain link fences are used in many applications for back yard's, Sports courts, and commercial properties. Let us help you with your fence decision by providing you with the correct look and fence design that your home needs. There are multiple combinations and options for your fence. Our most common combination is a Western Red Cedar fence with Galvanized Steel Posts. Let our experience and keen eye for design and fence construction build the right fence for you. CLICK HERE for an INSTANT online fence quote. OR complete the following form and we will contact you.